Rupert the Bear is moving to a new home alongside Postman Pat and He-Man following a £6m ($10.64m) deal. Express Newspapers has sold the controlling rights to the 85-year-old bear to Entertainment Rights (ER). 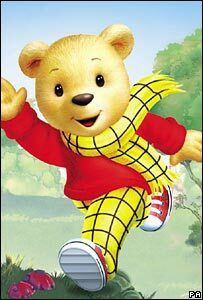 The UK media group plans to give Rupert a makeover before relaunching him with an animated TV series, DVDs and books. Rupert will be ditching his old boots in favour of trendy high-top trainers. ER plans to sell children's version of these new "bear boots". But, while his look is being "brought into the 21st Century", his red jumper and yellow trousers will be staying. "Whilst Rupert will retain his distinctive look and character, and will maintain his existing friendships, he will be joined in Nutwood by a brand new cast of characters," ER chief executive Mike Heap said. Mr Heap also said the group planned to breathe new life into the character after his recent low profile - much the same as the group did when it snapped up the rights to Basil Brush. When ER bought the wisecracking fox in March last year, little had been heard of his trademark "boom boom" catchphrase since the early 1980s. "ER's track record and expertise in building brands makes ER a natural home for Rupert. 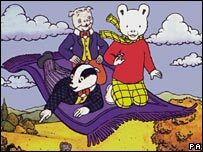 I have no doubt that Rupert Bear will continue to delight generations of children around the world," added Mr Heap. Rupert first appeared in a comic strip cartoon in the Daily Express newspaper in 1920 and has since gone on to sell 50 million annuals worldwide. ER said it plans to capitalise on the character's popularity in the key markets of the US, France, Germany, Spain, Canada and Australasia. Under the deal, Express Newspapers will retain a third stake in Rupert and his cartoons will continue to appear in the Daily Express. Entertainment Rights has rapidly expanded since it was founded in 1999 with the rights to 50 hours of TV programming. It now has over 1,800 hours of children's and family entertainment, and last month posted a 56% jump in operating profits to £1.2m for the six months to June.